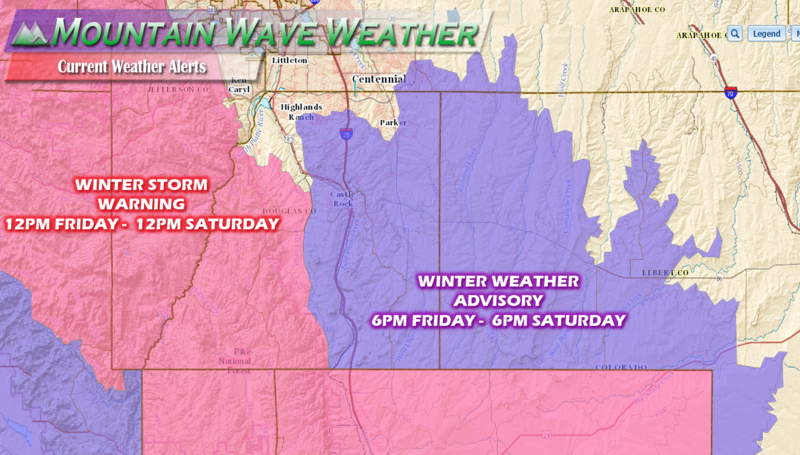 The Castle Rock area can expect minor to moderate travel impacts late Friday night into Saturday morning. 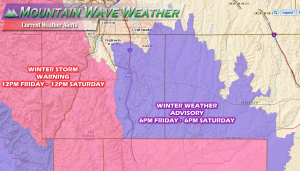 Travel may become difficult in the overnight hours across the Palmer Divide region, especially higher elevation areas South of Castle Rock and North of Colorado Springs. As with most storm systems this time of year, the forecast can still change up until the final hours when the storm gets here. 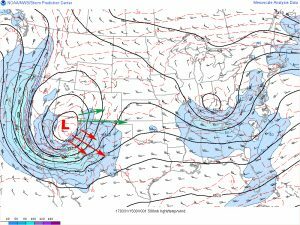 These types of spring storm systems are among the most difficult weather features in Colorado to predict, which is why you’ll see a lot of forecasts change from hour to hour, this is the case with these systems this year. What looks like a major blizzard 48 hours out can change to no storm at all at 24 hours out to a moderate storm 6 hours out. We do the best we can with the information we have but when the information we get is constantly changing or has a low confidence factor, we often get humbled quite a bit this time of year when forecasting. Expecting a transition to snow Friday evening, most likely later so not sure if the evening commute will see impact from snow. Models show most of the snow ending by late Saturday morning into the afternoon hours. There may be lingering snow into the afternoon for some areas. Castle Rock and Northern Palmer Divide is currently forecast at 2-6 inches of snow accumulation. Some specific areas may see more, especially favored areas just South of Castle Rock and some areas to the East. Winds look to be breezy at strongest strength, mainly areas South of Castle Rock will see higher winds speeds. So all in all folks, don’t expect a major storm out of this one. The travel impacts it causes will be mainly inconveniences but we don’t expect widespread road closures or widespread travel issues. If you are travelling between South Castle Rock and Colorado Spring, or in the western foothills of Douglas County, expect those to be the areas with the toughest road conditions. We will update the forecast if anything changes through the day on Friday! As we’ve gotten closer to our storm event, expected to roll into town this evening we see a very similar situation we’ve seen with the past two storms. 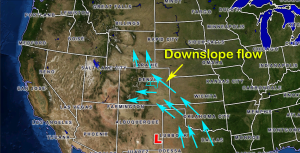 As of this morning the low pressure center is swirling over Arizona and there have been a few changes in the models and what we are seeing the storm doing this morning that will have big impacts for the front range of Colorado. This morning the low pressure center is over Arizona and is not moving a ton, but is expected to begin moving Eastward through the day. 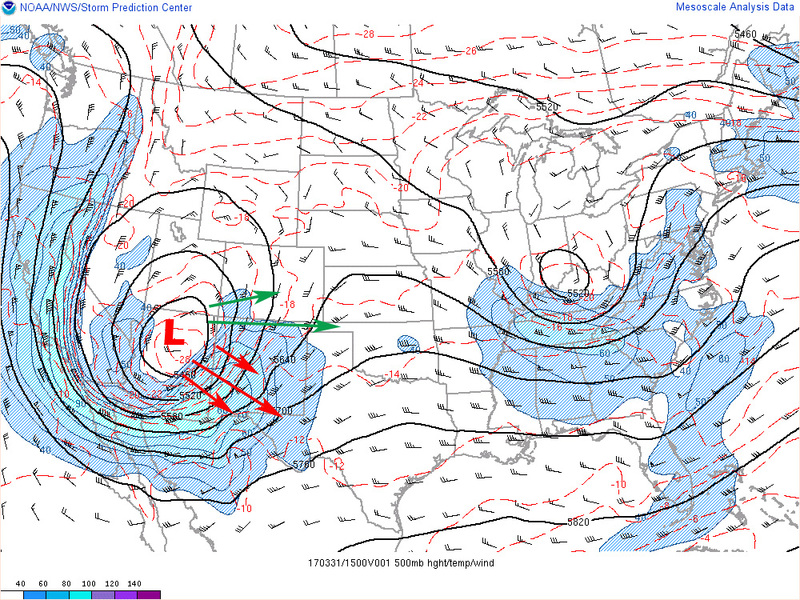 Initially models projected this feature to move due East with a slight Northeast turn which would set a lot of us in Colorado’s front range region up for a pretty significant snow storm. Model analysis this morning has the low moving East-Southeastward which would shift the highest amount of precipitation Southward. The cold air advection (meteorology term for cold air surge or cold front) support we though we would have is not going to be there. Does this mean we get shorted on snow? Yes! Do we get no snow at all? No, well at least we think not. The probability is that will see snowfall in our area, but it will be less significant than earlier thought. The graphic above shows the NAM model and what it now thinks the storm system will do. Notice the more southerly track it takes but also how the energy begins to stretch out, this will all affect how this storm behaves for us. The stretching reduces the energy the storm has and also cuts off colder air from the North, both of which equate to less snow for our area. 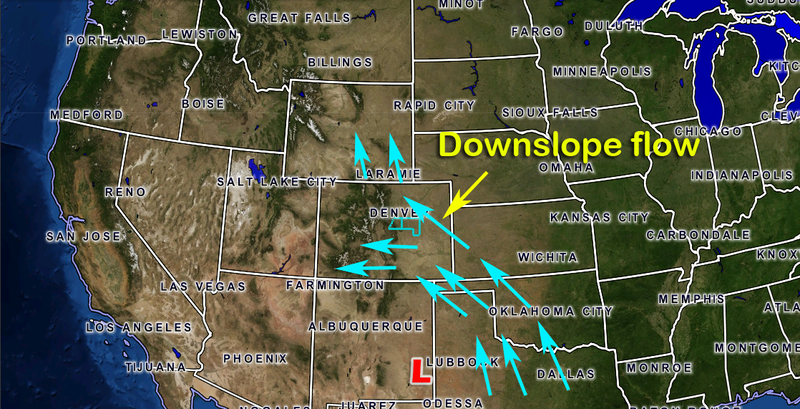 One other thing we will watch for is that if the storm sets up too far South we could see downsloping off of the Palmer Divide. If this were to happen we’d see a slight drying of the atmosphere North of Monument Hill which would mean even less snow than we’re predicting now. We don’t see indications of this just yet, but something to keep an eye out for. I’ll be the first one to point out that I’ve got a pretty good track record with forecasting, but this year is killing that a bit. These spring storms are typically very difficult to forecast so I’m used to that, but this year has been exceptional. I attribute this to a combination of storm track, models having difficulty even in the short range and a lack of cold fronts moving in from the North. All of these ingredients means my accuracy rating is taking a hit this year. 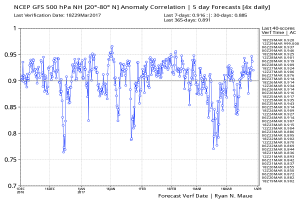 Speaking of accuracy, numerical weather models also track their accuracy with something called “Skill” or “skill score.” This is a method to track how accurate a particular weather model has been over a period… I won’t get too technical as there’s a lot of math involved in how this is calculated. The easy way of saying this is how accurate is a model over a time period. 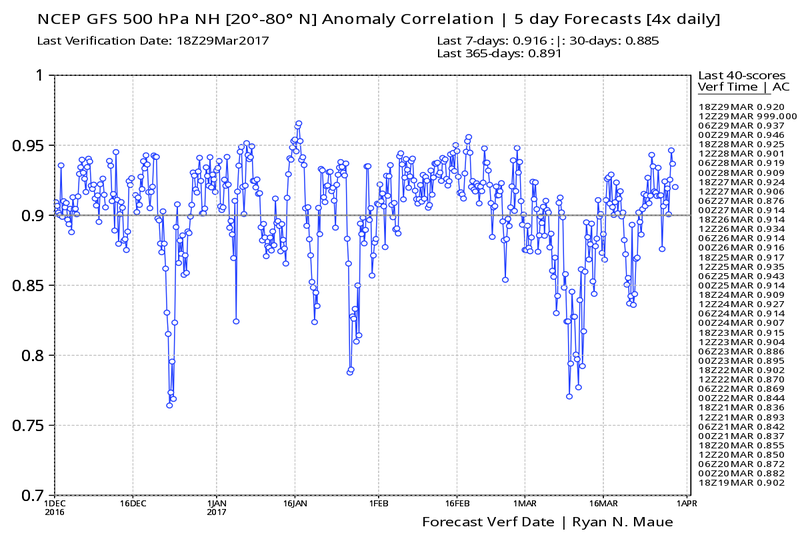 The image above is from the GFS over the past couple of months, notice a big drop in skill score as we head into March. This is a pattern shared by most models this time of year, spring is just a very difficult time to forecast across the country. This is the reason I try to focus on Impact based forecasting and probabilistic forecasting. At the end of the day the amount of snow doesn’t matter, what matters is will people be able to get to work tomorrow. Will people have to face road closures or power outages? These are the important things to know along with the probability these things will happen. In that way we are a bit different from a lot of the forecasts you will see on TV and the internet. We will usually provide you all the possibilities but also the likelihood of those situations of happening.